Born in the Midwest and raised in Florida, Marti made her way to Long Beach in 2001. She says, “It felt like coming home”, it reminded her so much of St. Petersburg Fla. with the small town feel amid a urban environment. A belief in being part of a community with a diverse and storied history, with waterways and Spanish Architecture. 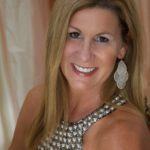 Marti got her degree in Fashion from Florida State University and spent 20 years in food photography and advertising after a brief stint in fashion design. Her international travel, photographing ethnic tribal minorities led her to get involved in international charitable work. Since starting her career in Real Estate in 2011, Long Beach has become the recipient of her years of involvement in charitable causes. Serving as Board member and Steering committee member, for both The Bucket List Project as well as Pathways to Independence. Marti’s involvement with JLLB ranges from Fund Development, Grants (Chair), Arrangements (co-chair), Kids In The Kitchen, New Member Training and Nominating. The training and mentoring experience at JLLB is what she loves most about the League. In her spare time, you will find her on the tennis courts, walking her dog, or enjoying all the creative arts in the LA area.